care for the spine and extremities. Your journey begins with a call today. Our team provides the best in family, sports and injury care for the spine and extremities. What Makes Van Ness Chiropractic Different? 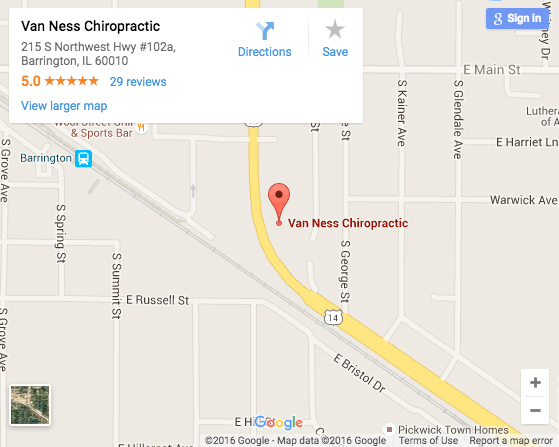 Van Ness Chiropractic, located in Barrington Illinois for over 21 years, provides the best in family and sports chiropractic care and offers the most current and advanced techniques available today. Dr. Jason Van Ness and his team deliver cutting edge treatment and education to meet your goals and needs. Every patient is unique at our Barrington Chiropractic office. Our doctors are trained to efficiently diagnose and prescribe the most effective course of treatment, keeping you active and enjoying the activities you love to do. The Van Ness Chiropractic integrated approach is direct and efficient because we understand that most people do not have the time nor the patience for health problems. By integrating chiropractic care, medical massage therapy, and customized rehabilitation protocols, we are able to “peel away the layers” to get to the root cause of your pain and dysfunction… QUICKLY! Instead of exclusively setting “clinical” goals for you, we also set “LIFE” goals. In other words, goals that are important to you, such as feeling strong enough to compete in the IRONMAN, being able to pick up your newborn without searing pain, or simply playing catch with the grandkids. No matter what your goals and motivations are, we are 100% committed to helping YOU get your health and life back as quickly as possible without any long drawn out treatment plans. Please allow us the opportunity to help you. Call or message us now for our first available appointment. Our office offers a friendly environment, giving our patients unhurried, comprehensive care to achieve the best results for them. As a Barrington chiropractor, the Van Ness Chiropractic team makes understanding your health needs and determining the best course of action our top priority. Emergency? We offer after hours care.